A current progress capture of the 75′ x 8′ “Moment #42” -Nature Series- mural in the works at Dorrill Dining Hall on the campus of Longwood University in Farmville, Virginia . The mural is coming along nicely and I am so enjoying being here in beautiful Farmville, Virginia. Creative times and so many wonderful moments shared with friends. 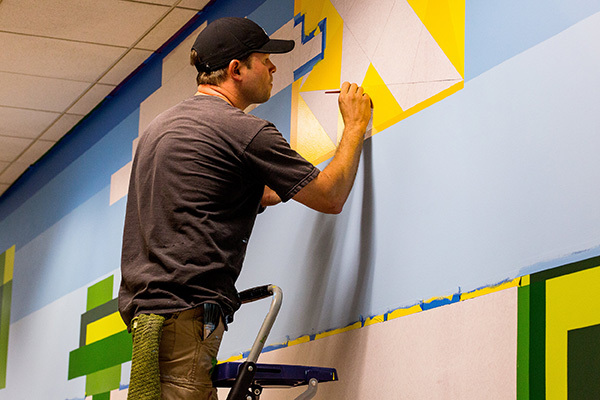 Honored to also have a very talented Farmville photographer and new friend, Jess Lapp documenting this mural project. Thanks so much for capturing these moments Jess, so awesome meeting you! ? ? PC: Instagram- @jessica_lapp ? : @valsparpaint #neonature #longwooduniversity #montyart #geometriclandscape #geometricnature #neofuturism — at Longwood University.